All transactions are safe and secure with a reliable history in online purchasing behind each of our associates. Buy the TMNT Costume Hoodies t-shirt to own TMNT clothing and merchandise. You want to be a hero in a half shell? No problem. Like the Teenage Mutant Ninja Turtles costume shirt, these TMNT costume hoodies will make you one of the gang in no time. The TMNT t-shirt graphic encompasses the front and the back of the hoodie. Top it off with a reversible knit cap that is available below, along with Teenage Mutant Ninja Turtles masks and original movie figures. Like the tee, the cap's front and back design transforms you into a full fledged turtle. 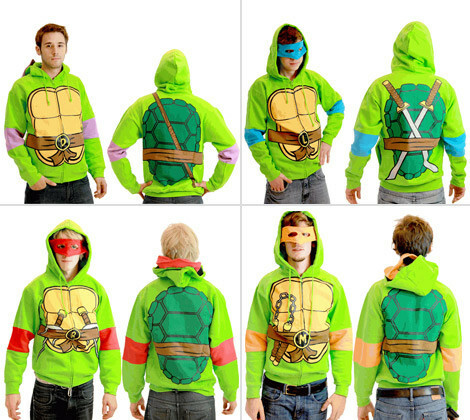 You and your friends can go as Leonardo, Raphael, Donatello and Michelangelo. Also check out the Shredder and Krang hoodies. In addition to the TMNT Costume Hoodies tee above, browse the TMNT Clothing Gallery for more apparel like men's and women's clothes, kids shirts or hoodies.